When DayZ's Dean "Rocket" Hall told me that if there was one game I had to play on the show floor at PAX East, any game at all, it would have to be Outlast , I really didn't think about the implications. I took it for granted that it would be a good game, but I failed to realize just how terrifying that meant Outlast would be. I mean, really, it should have obvious. Outlast is Amnesia meets [REC] meets Mirror's Edge meets Cloverfield. I made it as far as standing next to the big-screen television showcasing the trailer (“So, tell me about—Whoah. WHOAH .”) while talking to the folk from Red Barrels. When I told David Chateauneuf I'd rather eat a durian unshelled than actually get a hands-on with Outlast, it brought a grin rather than a look of affront. The guys behind Red Barrels know what they want—they want to scare the stem cells out of your liver—and they know how to do it. “We're huge, huge horror movie buffs,” Chateauneuf declares. Chateauneuf claims he owns about 500 horror movies and that between the entirety of the 10-man team, they probably own just about every horror game in existence. According to him, Outlast was built out of those experiences and the data accrued from asylum-related media, psychologists, specialists, and people uncomfortably familiar with what goes on in such locations. The team had a two-pronged objective with this game. Not only were they aiming to make it the stuff of nightmares, they wanted to make Outlast as realistic as possible. “These days, people are always recording something with their phones and their camcorders. So, we decided to use that to add to the experience of walking in the dark without a flashlight or a lighter—the idea is to keep things more grounded,” said Chateauneuf. It's one of the reasons Red Barrels stayed away from outlandish-looking antagonists. "The enemies that you'll encounter are mostly just crazy patients. We didn't want to venture too far into the whole 'monster' thing. The guys you meet are supposed to be normal human beings—just crazy ones. Those guys are human beings and they might say something, might interact with you. We want players to feel like they might be in an actual asylum." Chateauneuf goes on to describe how, in one instant, players might find themselves assaulted by a placid-looking individual in a corner and be completely ignored by the gibbering madman plowing down the corridor in the next. 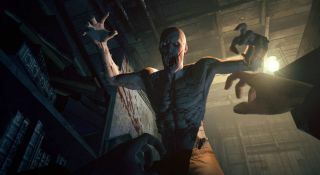 With Outlast, it seems, they're aiming to keep it both believable and unpredictable, to make an environment that is plausible enough for genuine terror. To further accentuate that sense of realism, Red Barrels also drew some inspiration from the slick Mirror's Edge, an action-adventure game famous for its realistic first-person view. “As you climb over objects or sneak through passageways, you'll see your own hands and feet. It's something that we wanted to put forward so that players will feel like they have a body and are not just floating cameras—we want to put players into a complete state of immersion. Things have gone well so far. Chateauneuf mentions a girl who had been so frightened, she broke the black-paneled booth in which the demo is being held by jumping into it. "There was also this guy yesterday that was talking to me before he took on the demo," he remarks. "He was really calm and it didn't look like he isn't going to do anything specific or suspicious but as soon as he encountered an event, well, he was definitely screaming. People in the line were staring at me with this whole, 'What's happening?' When I peeked inside, the guy in there was just freaking out. He eventually came out, laughing, however, and told us he enjoyed himself but, yeah, that was kind of funny."